PULLING UP THE FAMILY TREE BY THE ROOT. Sometimes when the Census gets stuck they call me as I have been doing research on the various families on Saba since I was a young man. Long before the internet I had amassed a whole set of information of the families in the Leeward Islands and beyond to establish their connections with people on other islands in the neighborhood. Research then involved not only checking the local census and property registers but when travelling to Curacao or the Netherlands every spare moment I got I would go to the National Archives to see what I could find there. Besides that reading Dutch historians of the 20th century who had been doing the same sort of thing. IN the process I became a sort of expert in this field. I discovered many mistakes which had been made by those Dutch historians as well. The problems of communicating with the Dutch which we lament on today were the same several hundred years ago. In 1665 the buccaneers from Port Royal in Jamaica captured St. Eustatius and Saba and carried back the slaves to Jamaica while sending a number of the Dutch as indentured servants to Barbados and the rest to St. Maarten. And yet the Dutch ignore this fact. The pirates were led by Edward and Thomas Morgan uncles to Sir Henry Morgan. Edward died of a heart attack and is buried on St. Eustatius. He was very corpulent and in his sixties and fell dead while attempting to take the Fort there. The pirates fell to strife among themselves and some ninety of them remained behind on Saba with the English, Irish and Scottish people they found there. Some 226 in all. One of the problems historians have is the census taken in 1699. Obviously this was done by a Dutch speaking person dealing with mostly illiterate pirates. What he wrote down as Sharles Symens should have been Charles Simmons who was already with his son Peter Simmons on St. Thomas in 1660 before moving to Saba. And so the census goes on from one confusion to the other. The 1705 and 1715 makes a drastic change in the names and corrected them to the English names they should have been in the first place. By that time the Commanders of the island were Sabans who knew what the correct names should be. People by then were also naming their grandchildren after their grandfathers in the correct English way. The other problem was Pastor Anthony Kowan of the Dutch reformed church of St. Eustatius. He baptized anyone who came forward. On Saba where there was no established church he would visit and baptize any and everybody who wanted to be baptized. Even practicing Jews were baptized by him. He too had a problem with English and wrote down many names which he thought should be spelled in the Dutch way. Kelly from Montserrat which was settled by Irish people became Celly and there were many other examples which this article does not allow space for. While oral history seems to be ignored by ‘historians’ who were dependent on a few yellowed papers in the Dutch archives I had a greater advantage. I sat around the old coal pot under the sea grape tree while grilling my grandparents as to how life was when they were children and stories they had heard from their grandparents. And it was not limited to them. I grew up at a time when there was no electricity, roads, airport, or even a harbor. Let alone radios or television. There was plenty opportunity to sit around with the old folks and question them. In later years while doing research many of the stories which I was privy to turned out to be real historical happenings. Keeping to the subject of genealogy. In a letter to the West India Company after the great hurricane of 1772 and in the census of the year 1823 all the names of males listed were English names. So taking that into account and that which had been told by my ancestors I based my research on those names and did not get misled by Kowan et al. Even the name Zagers in its various spellings can be traced to the South of England where the name existed at the time of the settlement by Europeans other than the Spanish in these West Indian islands. Of course I was not alone in doing research on my ancestors. I had great help from Gosta Simmons of Nortalje Sweden who did a tremendous job in documenting and sorting out information I would send to him. He shared everything with me. He also visited the island several times to search on the origin of the Dinzey family and of course the Simmons family and went beyond that to document as much as he could find. He died relatively young after suffering with cancer. His collection was donated to an obscure library in the South of Sweden. Professor Eric Simmons who died in his nineties was a great help in making corrections to many of the things which I wrote and adding much valued information to my research. He was a son of the famous St. Thomas Harbour Master Capt. Engle Simmons and his wife Estelle Vanterpool both from Saba. In the nineteen seventies I came in contact with Raymond Simmons from Venezuela whose great grandfather was John Miller Simmons from Saba a master carpenter and shipbuilder. After he died in a mining accident on Curacao, his wife and children moved to Panama during the construction of the canal. The sons started a pharmacy there married two young ladies from Venezuela and ended up in that country. No one born and raised on Saba could be more proud of their Saban ancestry than Raymond and his extended Simmons family. He started a newsletter ‘Somos Primos’ [We are cousins] which documented many of the people from that branch of the Simmons family. Later on he started the very popular Facebook site ‘Of Saban Descent’ in which hundreds of photos of old time Sabans have been placed by families from around the world. Also Michelle Yaros Pope partly of Puerto Rican descent and the rest Simmons from Saba was very helpful in collecting old family photographs and organizing two Simmons family reunions on Saba with family members from all over including the Dominican Republic. For the surrounding Leeward Islands I was dependent on people like ‘Uncle’ Carl Buncamper, Mr. Siegfried Lampe, and Fred Labega Jr. As well as those who had been doing research on the various families of the Leeward Islands. When I started documenting the Saban families I would write the information by hand in notebooks under the various family names past and present from Saba. Some of them had very interesting origins. Descendants of these people changed the names to suit where they lived. I will use the example of the Holm family. One of my friends who had changed his name to Holmes used to tell me that he was descended from Eldad Holmes who had built the New York water system. I tried to tell him as politely as I could that this was not the case. The first Holm recorded in these islands was on St. Eustatius. Laurens Holm was listed in the Rodney Roll of 1781 as living there. Further research has the family living in Osterholm in Denmark before coming out to the islands. 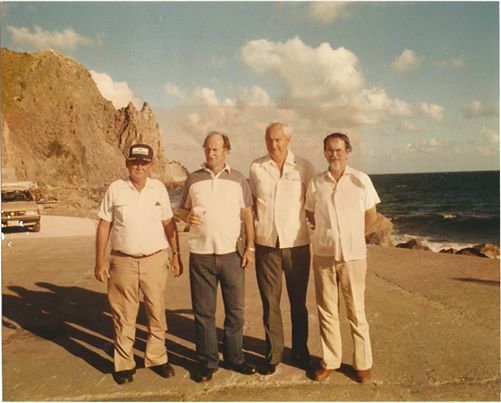 The Holm’s of Saba all originated from Laurens of Statia and intermarried with several prominent families on Saba. The trend the last years has been looking into ones DNA to find out where the ancestors came from. I had two done voluntarily and one when I was pulled offline in New York. That one there was no choice. The man who interrogated me had a spray can of what looked like flit and the choice was to flit my mouth or take a swab. So I gave in not even knowing at the time what the swab was for. A young lady from St. Barth’s who was taken off line with me told me that after she told them where she was from they let her go. St. Barth’s people too rich for swabbing I guess. Anyway be it what it may the last one I took was from the National Geographic. All European, and Neanderthal and Denosovians, and the most remarkable was 15% from Northern Iran. I read a lot. The mystery solved itself. In the book ‘Black Sea’ by Neal Acherson (From Pericles to Putin). Many of my ancestors are from the area between England and Scotland. On Page 218 I quote the following:” Here, towards the end of the second century A.D., a large force of Sarmatian lancers arrived. They were Iazygians, the vanguard of the slow Sarmatian migration from the Black Sea steppe towards the West, who had crossed the Transylvania Mountains and entered the North-Eastern Hungarian plains. From there, they began to raid the Roman frontier on the middle Danube until Emperor Marcus Aurelius led an army across the Danube and defeated them. He had intended it seems to have them massacred. But problems elsewhere in the Empire required his attention, and he offered them the option of enlistment instead. The Iazygians accepted and were drafted to northern Britain. Some 5.500 cavalrymen, presumably accompanied by their horses and families, made the journey across a continent and a sea. The Sarmatians never went home. The Empire lost control north of the Danube, which meant they could not be returned. For two hundred more years, until the final Roman evacuation of Britain in the fifth century, the descendants of Iranian speaking nomads continued to multiply and to be found in the lower Ribble valley. And so you can see how interesting research into your family roots can be and how people have ended up all parts of the world.